A strange set of circumstances happened last month. I received a box of photos and documents that were passed from Donna’s estranged brother to his girlfriend following his death in 2006. 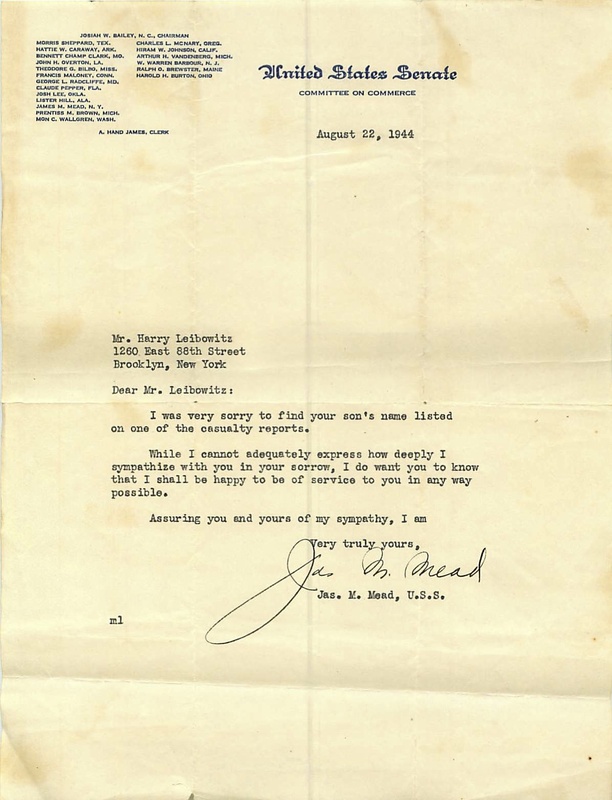 (Her brothers lawyer wrote to Donna and said in his will Jack noted that you are my sister but I am not giving you anything.) True story. The girl friend passed away this year and her friend was cleaning the house and found a box of photos and documents. There were photos of Donna, her mother, and various family members including her uncle Oscar Leibowitz. Donna’s mothers brother. Surprisingly the box even contained her grandparents naturalization papers and documents. Notification of Death during combat mission. 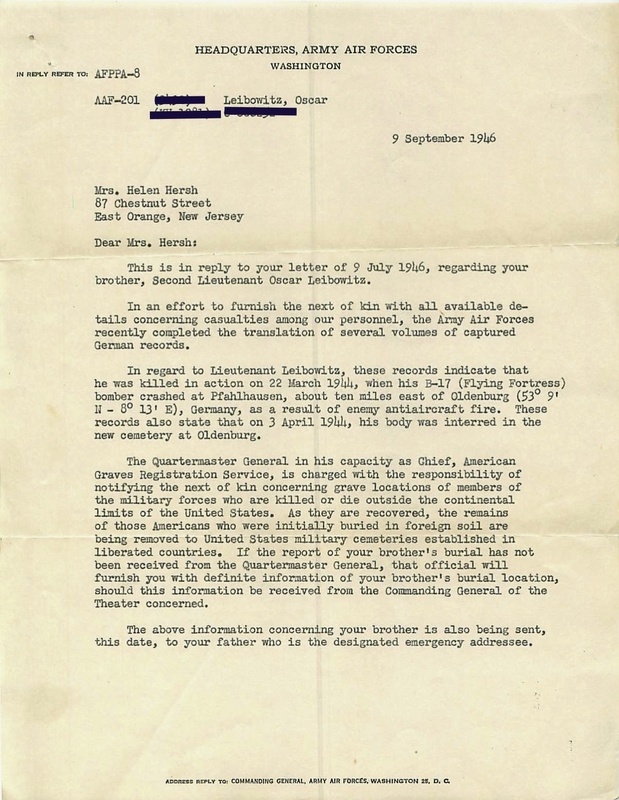 Army Air Force notice of Lieutenant Leibowitz’s death while on a missionBelow are some additional letters and notices about his death and service. He was awarded Purple Heart. The Purple Heart was not his only medal. In September of 1943 he was awarded for “exceptionally meritorious achievement and participating in five separate bomber combat missions over enemy occupied Europe. 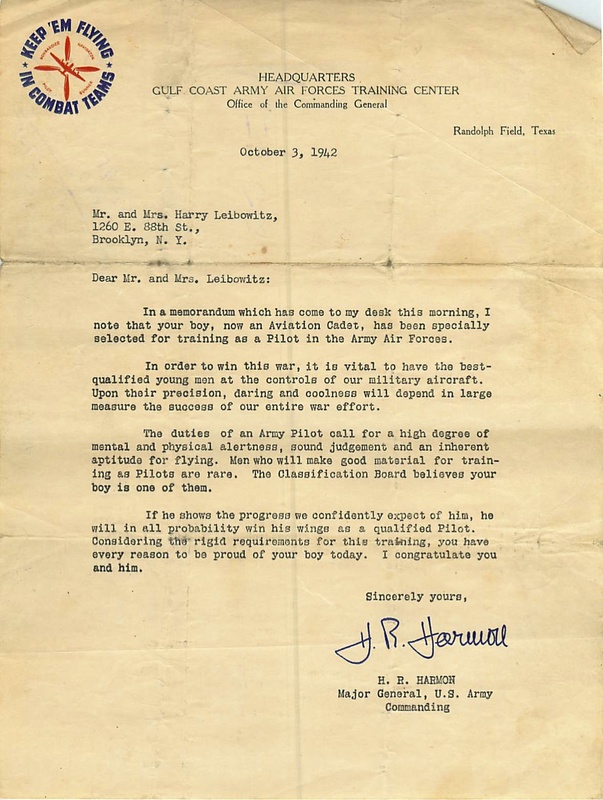 In October of 1942 the family received a letter from the Army Air Forces Training Center announcing that Oscar has been selected for training as a Pilot in the Army Air Forced. Those are some of the military files and government letters regarding this airman’s serving in the Army Air Corp and his death. There are also communications regarding returning his remains from Germany to the US for burial. That process took until 1949 before his remains were returned to the US and buried in Long Island. Yet there is much more here that offers a rich mosaic of this one airman, a son, a brother, and uncle. There were letters he wrote home and many photos. Below are some of the examples of his life while in service to the US. These letters are fascinating insight into what it is like to be a soldier and keeping the family up to date. He requests his birth certificate so he can apply to pilot training. Another is about not getting furlough. There is one where he describes his first cross country flight of 300 miles. Just letters home but a window into the man and the moment. CLICK ON THE LETTER BELOW TO SCROLL THROUGH THEM. Here is a gallery of photos that show training in the US and being stationed in England and Europe. CLICK ON THE PHOTO BELOW TO SCROLL THROUGH THEM. Oscar with another soldier at boot camp. On the ground training for flying. Originally when I received these items I just wanted to grab the photos of Donna and any documents that were specific to her and toss the rest. As I looked through them I found a family history all but forgotten in a box stuck in a basement in Berkeley. This deserved more. The kindness of a stranger to find Donna’s address and write at first set me back. Donna and her brother had a history that was fraught with pain and anger. I was angry. Going through this box and seeing not what is lost and forgotten but what is found deserved to be remembered in some small measure. The immediacy of our digital world today and the movement to what is next, new, hot, and liked somehow belittles the rich tapestry of small narrative moments in time. This is a memory that lives for now, as it has in a time past. There are moments when memories sting. Today these memories sing. I was able to find two references to Oscar here and here.